How does Douglas Elliman’s slow-and-steady approach stack up against Compass’ speedy spree as the two relative newcomers try to increase their L.A. market share? New York brokerages Douglas Elliman and Compass strutted into the Los Angeles market a few years back and vexed local firms with their deep pockets and aggressive poaching tactics. Their fans said they’d shaken up the brokerage world for the better, while their critics said they’d driven down the whole industry’s margins with unsustainable business practices. Either way, no one expected the firms to be an overnight success. After all, Los Angeles’ high-end market is famously nubilous and has historically been controlled by just a handful of secretive star brokers who deal primarily in off-market transactions. By Aaroe’s measure, the verdict should now be in. And for venture capital-backed Compass in particular, the “make or break” rhetoric from competitors is reaching fever pitch. Douglas Elliman Chairman Howard Lorber, whose firm has taken a vastly different approach to its own expansion, echoed that statement and predicted it would take even less time than that for Compass to kick the bucket. So, if it’s make-or-break time for Elliman and Compass, just how far have the firms really come? And does it look like they’ll survive or become the latest casualties of the competitive L.A. market? Read on for a look at the firms’ respective scorecards. Lorber openly admits that, for Elliman, Los Angeles is still a loss leader and a drag on the company balance sheet. That, coupled with Elliman’s spending on other nationwide expansion initiatives, is having an impact on the firm’s bottom line. Elliman reported profits of just $100,000 for the first quarter of 2017, according to parent company Vector Group’s March earnings report. But while West Coast operations aren’t driving revenue right now, Lorber still sees a light at the end of the tunnel. “All those markets in the beginning are losers,” he said at a TRD event in May. Stephen Kotler, president of the Western region for Douglas Elliman, told TRD that Elliman had invested heavily to create a permanent home with its Beverly Hills office, which it moved into in 2016. That meant big upfront costs but long-term value. Sources said Elliman’s biggest challenge has been recruiting top-shelf talent amid an L.A.-wide poaching frenzy. While the company recruited big-name agents Josh and Matthew Altman, formerly of Hilton & Hyland, in 2015, shortly after its launch, it has not had enormous success in recruiting since then. Powerhouse luxury firms like Hilton & Hyland and the Agency have hung onto most of their top producers, for instance. Kotler admitted that recruiting has been difficult. To that end, marketing is a key tool. The company launched a year-long national campaign in May called “It’s Time for Elliman” across television, print, digital and events. It is also revamping its magazine, ELLIMAN, with two issues devoted to new development and others about resale. Lorber said its marketing play is geared toward cementing its position as a national brand. Michael Nourmand, president of Beverly Hills agency Nourmand & Associates, said Elliman took time to build local brand awareness carefully, citing the brokerage’s modest first L.A. office on Santa Monica and Beverly Boulevard compared to its current space in Beverly Hills as an example. Elliman spared no expense with its swanky Beverly Hills office, hiring architect Patrick Tighe to design its two-floor, 11,000-square-foot space with a sculptural staircase and open floor plan. The firm, which opened in L.A. with 20 agents, has expanded to 125 and opened its second office, in Malibu’s Carbon Beach area, this summer. While Compass has expanded to more than a dozen California locations, Elliman has stuck to just a couple in ultra-high-end areas. Douglas Elliman’s new custom built 11,000-square-foot office at 150 El Camino Drive in Beverly Hills is said to illustrate the brokerage’s investment in the L.A. market. Last year, sales volume was more than $700 million with 100 agents, and it’s on track to hit $1 billion in 2017, according to Kotler. 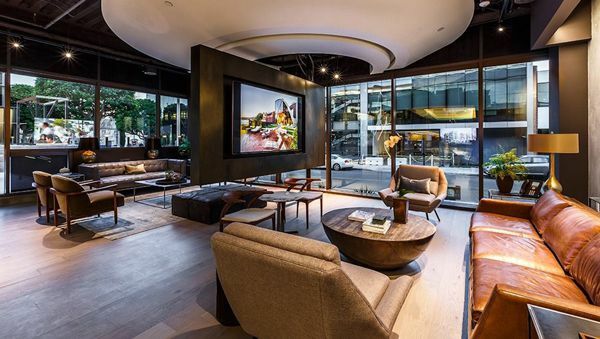 The biggest bright spot for Elliman is its new-development division, which is gaining traction thanks in part to Lorber’s connections with New York developers building in L.A. The company’s decision to enter L.A. in the first place was prompted by an exclusive assignment to handle sales and marketing for the second phase of Metropolis, the $1 billion mixed-use development in South Park by developer Greenland USA. Now Elliman is marketing the Edition Hotel & Residences in West Hollywood, which Lorber is developing in partnership with New York developer Steve Witkoff. Since few L.A. firms have significant condo marketing experience, Elliman’s vast new-development resources give it a leg up in that arena, sources said. And sponsor sales could eventually translate to resales. Elliman has also admitted that it may look to acquisitions as a means to garner more traction in L.A. — a growth strategy it’s already employed in other national markets such as Aspen; Elliman got its entry into that market when it merged with veteran real estate firm Joshua & Co. in 2014, for instance. While rumors circulated in recent months that Elliman was eyeing fast-growing Beverly Hills firm Teles Properties as an acquisition target, spokespersons for both Elliman and Teles denied that any deal was in the works. While Elliman has been relatively conservative in expanding its brick-and-mortar L.A. presence, Compass has taken a vastly different approach. The startup, which opened its first office in Beverly Hills with 19 agents in 2015, later opened locations in Montecito, Pasadena, Malibu, Burbank, Playa del Oro, Brentwood and Santa Monica. In the first half of this year alone, it opened five additional offices in Santa Barbara, Calabasas, Hidden Hills, Newport Beach and Manhattan Beach. In total, the company now has 13 offices in Southern California with more than 300 agents. Rob Lehman, Compass’s chief revenue officer, told TRD that the company had also started the process of leasing two more office spaces last month, but he declined to name the locations. Fueling the company’s office rollout is a deep well of capital from the tech investment world. Compass raised $75 million in a Series D round led by Wellington Management in August 2016 — joining the unicorn club with a valuation of $1 billion and bringing its total to $210 million raised from investors since launching in 2013. Lehman admits that the company, founded by Reffkin and Ori Allon in 2013, is moving at a breakneck pace. Lehman said revenue was $180 million last year, and Compass expects to more than double its revenue this year. But skeptics say its gains in sales volume are still outmatched by its spending, which it can’t keep up forever. And those offices could become liabilities if the market softens substantially. Nourmand cites the August 2016 announcement that Compass would double the size of its Beverly Hills office on Wilshire Boulevard to 25,200 square feet this year as evidence of the startup’s excess. Rival L.A. firms claim that Compass’s perceived success is built on shaky foundations. They allege high employee turnover and say Compass’s technology, which was supposed to be a game changer, isn’t actually a huge draw for agents. Some even claim that Compass is simply expanding to give the appearance of traction in a bid to satisfy investors for a prospective initial public offering. While Compass representatives have said that the company will likely IPO at some point, they declined to provide a likely timeline. Listings giant Redfin’s upcoming IPO could prove to be a bellwether for Compass’ prospective stock performance, particularly since Redfin has readily admitted to forking out scads of cash on tech and recruitment. But expenditures on recruitment in some ways paid off for Compass, which has managed to scoop up some of L.A.’s top agents, such as Kim Kardashian’s favorite broker, Tomer Fridman, and broker to star athletes Kofi Nartey. But Compass has also seen at least eight brokers jump ship this year to go back to their former employers after a year or less. Some agents left because they felt the startup was too focused on expanding its physical presence and overlooked the needs of its staff, such as creating networking opportunities and fostering a sense of community. The company simply didn’t have the inside track on deal flow, sources with knowledge of the exits told TRD. Lehman claimed the criticisms were simply sour grapes. He also said that Compass no longer offers the honey-filled incentive packages for brokers that it did in the early days. “The reality is we’ve given sign-on bonuses to fewer than 3 percent of the agents that have joined Compass, which is drastically different than the perception out there,” he said. But some said the financial underpinnings of Compass’s model don’t add up.